Gobel James was born in 1930 in Amarillo, Texas. He enlisted in the Aviation Cadet Program on May 28, 1952, and was commissioned and awarded his pilot wings on June 16, 1953. After combat crew training, James flew the F-86F Sabre with the 4th Fighter Interceptor Wing at Kimpo AB, South Korea. In December 1954, he was transferred to Clovis AFB, New Mexico, where he served until he left active duty in June 1956. James went into the Colorado Air National Guard in September 1956, where he flew T-33 and F-80 Shooting Stars, F-86 Sabres, and the F-100 Super Sabre. During this time he flew the Slot position with the Minute Men, the Air National Guard Precision Demonstration Team, flying F-86F's. He was recalled to active duty in October 1961, and flew F-100's and F-105 Thunderchiefs at McConnell AFB, Kansas. He completed the U.S. Army Jump School in July 1964, and he was assigned to Bitburg AB, West Germany in September 1964, flying F-105's and the F-4 Phantom II. In October 1967, Major James began flying combat missions in Southeast Asia in the F-105F Wild Weasel aircraft. After a short tour in Korea at the time of the USS Pueblo incident, he was stationed at Korat AB, Thailand. James was shot down over North Vietnam on July 15, 1968, and was immediately captured and taken as a Prisoner of War. After spending 1,703 days in captivity, he was released during Operation Homecoming on March 14, 1973. Col James was next assigned to Luke AFB, Arizona, as a Squadron Commander. He went through the National War College in Washington, D.C., from August 1974 to June 1975, and was then assigned to the Defense Nuclear Agency at Kirtland AFB, New Mexico. 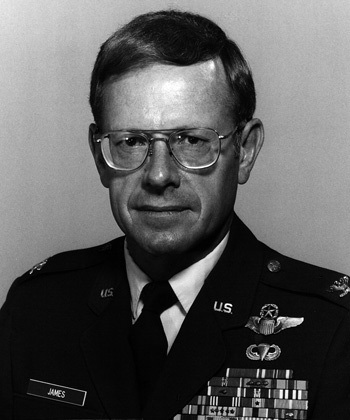 In August 1978, James became Deputy Commander for Resources at Reese AFB, Texas. His final assignment was as Base Commander at Mather AFB, California, where he served from 1981 until his retirement from the Air Force on May 25, 1984. Col James wears Command Pilot Wings and the Parachutist Badge and accumulated over 3,600 flying hours in his Air Force career. After retiring from the Air Force, Gobel joined McDonnell Douglas Helicopter Company in Mesa, Arizona, where he served as Program Manager for weapons systems on the AH-64 Apache helicopter and later as a Department Manager in the Customer Support Division. He retired from McDonnell Douglas in 1995. Gobel James is married to the former Betty Payton and they have three children-Gloria, Joyce, and Todd. For The Period July 1968 to February 1972. 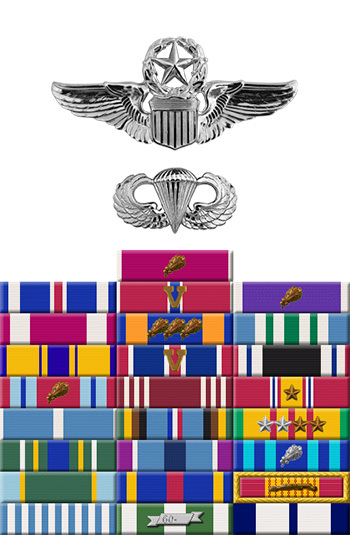 This officer distinguished himself by exceptionally meritorious conduct in the performance of outstanding service to the United States as a Prisoner of War in North Vietnam during the above period. His countless efforts, by a continuous showing of resistance to an enemy who ignored all international agreements on treatment of prisoners of war, in the extremely adverse conditions of the communist prisons of North Vietnam, demonstrated his professional competence, unwavering devotion, and loyalty to his country. Despite the harsh treatment through his long years of incarceration, this individual continued to perform his duties in a clearly exceptional manner which reflected great credit upon himself and the United States Air Force.